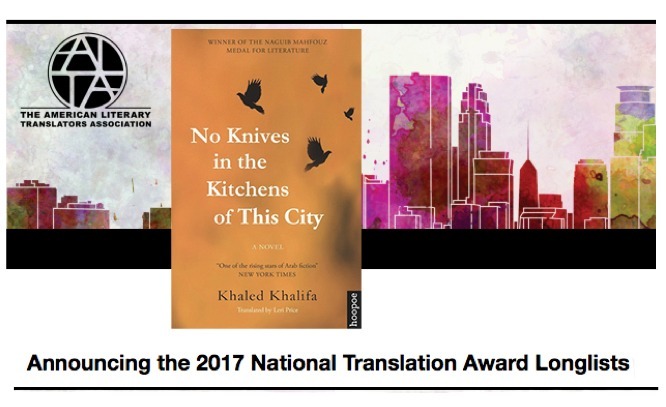 Khaled Khalifa’s No Knives in the Kitchens of This City, translated by Leri Price, is among the two Arabic books to make this year’s ‘National Translation Award’ Longlists. The American Literary Translators Association, otherwise known as ALTA, announced a few days ago the longlists for the 2017 National Translation Awards in both poetry and prose. This year’s lists feature works from 11 different source languages, including two from Arabic: Amjad Nasser’s A Map of Signs and Scents, translated by Fady Joudah and Khaled Mattawa and Khaled Khalifa’s No Knives in the Kitchens of This City. Read the full post on Marcia Lynx Qualey’s ArabLit‘s blog (June 27, 2017).